Amish are not common in the Deep South, a fact which holds true in Georgia, which has no Amish communities. However, residents of Atlanta, Augusta, Macon and Athens are all within easy driving distance of Amish furniture sellers (while Savannah residents are within range of a number of SC and FL dealers). Amish-crafted tables, beds, rockers and other pieces have wide appeal for their high quality and attention to detail. Peach State residents have a number of options for Amish-built woodwork. Amish made patio furniture, sheds, swingsets, gazebos, and more just outside of Atlanta, Georgia. Standard delivery and setup is available for most products to Atlanta and surrounding areas. Rustic cabin-style furniture from Amish craftsmen in Pennsylvania. Made from solid hardwoods including hickory, cedar, sassafras, oak, and “barn wood”. Coffee tables, dining room tables, chairs, dressers, mirrors, bedframes and more. Location of the largest Amish Made Adirondack Chair in the World. 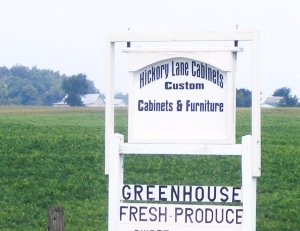 A large Amish-made furniture outlet, provided by numerous Amish and Mennonite builders. Products include outdoor wood & poly (recycled plastic) furniture; indoor hickory rockers, bedroom sets, living room sets, dining room sets, accessories, & more. Rustic style Amish made rockers, beds, end tables, hoop chairs, gliders, toy boxes, hoop chairs, accent tables, leather upholstered chairs, and more. Much furniture made in-house but also offering some Amish crafted items including tables and bath sets. Carrying a wide range of non-Amish brands along with the Simply Amish furniture label. Specializing in early American woodworking reproductions. Offers Amish-made hickory rockers. Find Amish furniture dealers outside of Georgia at the Amish Furniture Guide main listings page. Note to Georgia residents: Please be sure to check opening hours of any Amish furniture businesses listed in this guide before traveling long distances to visit them. While we strive to keep this directory up-to-date, business locations and availability can change. Not responsible for changes to information. Georgia has no Amish community, but Amish quality furniture has gained appreciation in the Peach State. Amish furnishings have found a following in Georgia and other states thanks to a reputation for high quality, solid hardwood construction. Amish craftsmen, guided by Plain Christian values, produce top-notch furniture in their small woodworking shops scattered through Amish communities across the country. Family life is very important to Amish, and all members of a family are often involved in home business. Amish children learn a strong work ethic from an early age, an aspect that has carried over from an agricultural heritage into the newer furniture-making tradition. Amish furniture comes in a range of traditional and contemporary styles. Amish craftsmen create “heirloom quality” pieces from a variety of solid hard woods, including hickory, maple, cherry, and quartersawn oak. A number of rustic furniture dealers in Georgia offer Amish-made items. Amish wood workers typically produce a standard range of pieces, but will also custom craft individual items for customers in Georgia and beyond. In recent years, Amish have migrated from their traditional heartland of Ohio, Indiana and Pennsylvania, driven by growing families and a lack of affordable farmland in some settlements. Amish communities have been established in southern locations like Tennessee, Mississippi and Kentucky. Furniture shops offer a reasonable alternative to farming, preserving Amish values while allowing family to work together to craft high quality furniture items for their customers, who might live in the same communities as they do, or anywhere across the nation. Amish once lived in Georgia, though none do today. With a growing population and entrepreneurial knack, will Amish attempt to settle in the Peach State again one day? Whether they do or don’t, Georgia residents have a number of outlets for Amish furniture across the state. You don’t have to travel far to buy Amish and Mennonite furniture. View a wide selection at Dutchcrafters. I have a 35 yr. old Jenny Lind crib that I would like made into a cradle. Not a antique os course but yet holds many memories. The crib has all parts but I am not bent on using them all…..perhaps a design that could incoporate the spindles. Do you take on such projects? I am Yankee girl and grew up within an Amish community and am well awarse of the fine craftsmanship that sets thier work apart. I believe there is actually a newer order community outside of Perry, GA. You may want to check your sources. Perhaps though they are mennonite. No Old Order Amish in Georgia, unless they just arrived. They are probably a Mennonite group or Beachy Amish perhaps? I live in Perry, GA — They are Mennonite. I am looking for someone to make wooden soap dishes in a large volume. Can anyone out there help me. Looking for 42 in. Cannon Wheels. I live in Washington. Ga. If you have any or know where I can find then in the state of Ga. Please let me know. I am trying to locate where I can buy an adult 3 wheel tricycle like I see the Amish riding. I live in a retirement community and would lik to have this to ride to my neighbors. I live near Athens Ga and Gainesville, Ga. Thanks so much for your time. Trailmate has 2 dealers for adult tricycles within 100 miles of Athens, Georgia. Other brands are Sun, Tristar, Capri, Husky, Joyrider. WalMart sells Schwinn adult trikes. My husband has a lot of t-shirts that I would like made into a quilt. I live in Augusta, GA. Is there an Amish community within driving distance that make quilts? Interested in having a cabin built or older house remodeled and additions completed. Looking for Amish construction crew or builders to hire. Near Albany, Ga.
We need two sets of drawers, like chests of drawers, to go in a closet. The width is 66 1/2”, depth 24”. This will be in a closet. We were thinking on five drawers each side. Height should be so my 6’2” husband can see the top. We want solid wood, dovetailed drawers and a quality finish. We need a solid top to go above each to fit in the space. The most inexpensive, durable wood and finish are fine. Is this something you would make? Does anyone know where you can find an Amish London Rocker in Georgia?